Free Bradley Manning, Free the Boat to Gaza, Free Women, Free Humanity! Bradley Manning’s attorney reports that his “overall mood and demeanor has improved greatly” since his move to Ft. Leavenworth. He can now meet with his defense team and receives regular visits. He also “wishes to extend his sincere appreciation for those who have taken the time to send along their thoughts and well wishes.” (Details on writing to him are here.) This improvement has everything to do with the international outcry against his treatment at Quantico, which was widely condemned as inhumane. The demand to Free Bradley Manning must grow and spread. 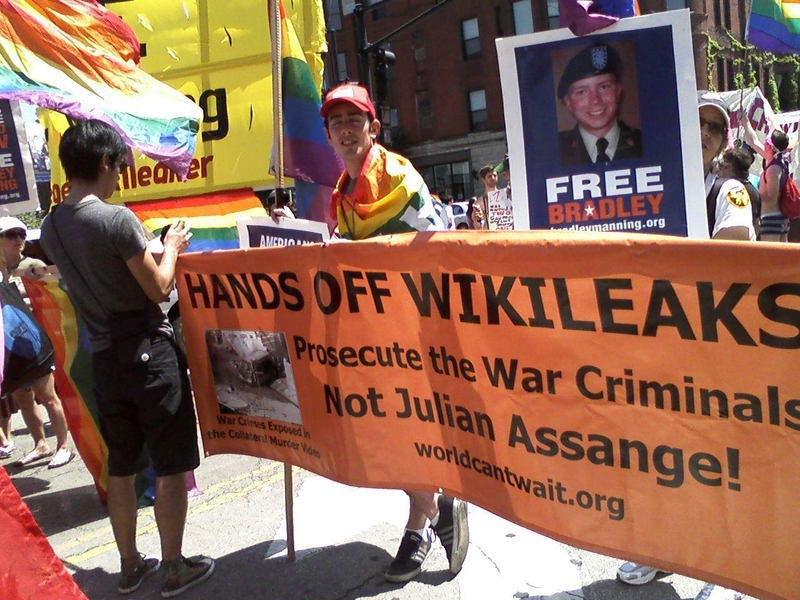 This year’s Pride Parade in Chicago was another record breaker, which made it all the more important that our Free Bradley Manning Contingent was part of it. Initiated by the Gay Liberation Network, the contingent included World Can’t Wait, Code Pink, South Siders for Peace, Stop F.B.I. Repression, Vietnam Veterans Against the War and others. The face of Bradley Manning and his story got out very widely, with thousands of flyers grabbed up by crowds lining the street. World Can’t Wait marched with the “Hands Off Wikileaks, Prosecute War Criminals – Not Julian Assange” banner (left), and the GLN truck featured an enormous 20 foot banner that read “Free Bradley Manning – Gay Alleged Wikileaker.” Full reports from Bradley Manning contingents in the Pride Parades in Chicago, San Francisco and New York are here. Overall the energy from the crowd was very positive. One VVAW activist who has marched in DC and at many anti-war actions around the country said, “I definitely never received such strong and positive a response/reception by spectators. It was a great feeling of support I never felt before. REAL nice change of pace from what I’ve been used to.” We also know that Bradley Manning’s story and what it all means in the larger context of these expanding U.S. wars and occupations needs to get out more broadly. So the newly coalesced Chicago Bradley Manning support network will be marching in three local parades over the July 4th weekend. Please lend your support if you’re at the Hyde Park or Oak Park parades on July 4! Why the international Freedom Flotilla to Gaza? Watch this moving video here. ← We're Going All OUT For Bradley Manning This Summer!